You may have suffered the same fate. There are many reasons why people won’t answer your questions ranging from lack of clarity of the question to fear of public speaking. Here are the 10 steps for asking questions in a presentation which will help you avoid being left hanging. Comedians warm-up their audiences – or if they’re stars – they have another comedian do it for them. You also need to warm up your audience first. They need to get to know you and trust you a little before they’ll venture answering a question. But don’t leave it too long before you start asking questions. If you leave it too long, people will settle into a passive “TV-watching” mode and it will be difficult to rouse them into responding. So once you’ve established rapport (2-5 minutes) start asking questions. The audience will then get that this is an interactive presentation and will stay on their toes rather than settling into that passive mode. Plan your questions so that they move your presentation forward. This matrix will help you plan your questions. 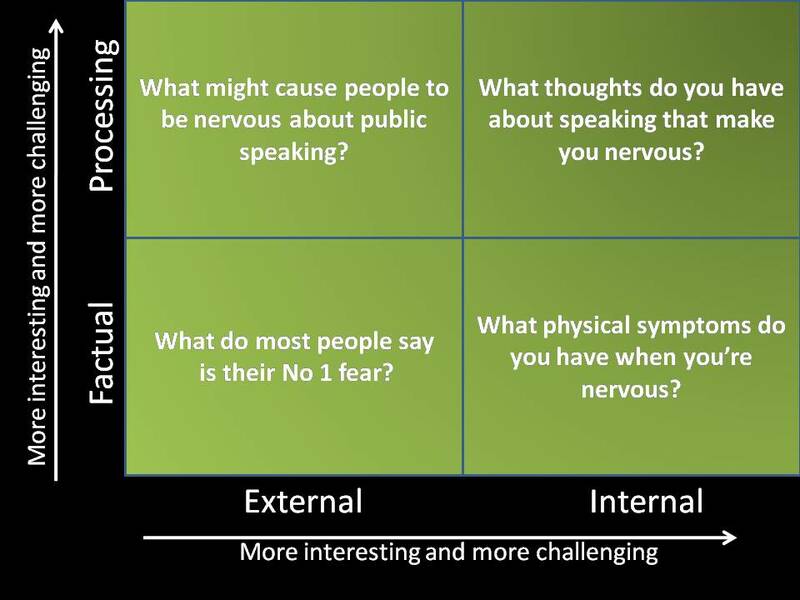 For example, say I was giving a presentation on “Overcoming your fear of public speaking” I could use this matrix to come up with progressively more challenging questions. I would start with questions from the bottom-left corner. These are easy questions which will get me and my audience on a roll. But if I only asked questions like this they would soon become trite and boring. More quiz show than presentation. So as you move through your presentation move towards the top-right corner and ask more challenging questions which will get your audience thinking. Here’s a resource for asking challenging questions. 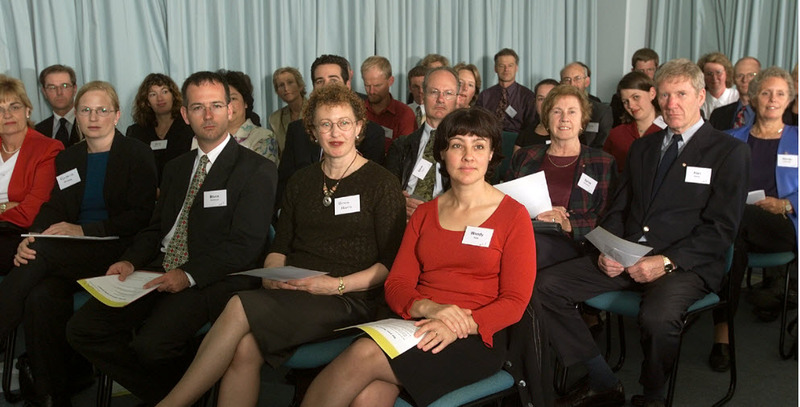 At every stage your questions needs to be tightly choreographed with the substance of your presentation. The answers to each question need to move the presentation forward. You’ll get from this that you need to carefully plan your questions. You can’t just blurt out a question that just popped into your head. Asking engaging questions that your audience will answer needs careful planning. Avoid mixing rhetorical questions (these are questions you don’t expect your audience to answer) with “real” questions. Your audience will get confused about whether they’re supposed to answer or not. A major reason people don’t answer questions in a presentation is because they’re not clear on what the questioner really wants. Never underestimate the ability of the audience to misunderstand your question. The build-up to and the phrasing of your question are both critical to ensuring that people understand the question and are comfortable answering. For example, in my presentation on nervousness, if I simply ask “what symptoms of nervousness do you get?” I might not get many responses and some might be slightly off-topic (eg: I don’t like talking to people I know”). I’ve shown them what I want by describing my own physical symptoms. I’ve made them more comfortable about sharing these personal details by sharing first. I’ve made my question ultra-clear by asking for “bodily symptoms”. Again, planning is critical. Draft your questions and then test them out on your friends and see if you get the type of answers you’re looking for. Then refine and test again. You want people to understand you the first time. To make sure you get the phrasing right during the presentation, write the question out in full on a small card and read your question from the card if you need to. Quiz show hosts do this and so can you. You could also write the question on a slide so that people can read it for themselves and ponder on it. Have them talk to their neighbor about their answer to the question. Only then ask for their answers. This is an incredibly effective technique. It gives people a little more time to think in a non-pressurized situation. They get to checkout their answer and get feedback that it’s not totally stupid. And thirdly they get to rehearse answering the question. All of this has them be more comfortable answering out loud in front of the rest of the group. Split your audience into small groups (2-4 people) to discuss the question. Then ask for one person from each group to summarize the answers from that group. The spokesperson is just reporting back so there isn’t the same fear of looking stupid with a wrong answer. Less confident people won’t have to speak in front of the group but will still have been able to take part in the discussion. Hand out post-it notes and ask people to write their answer on the post-it and then come and stick it on the wall. Ask people to write their answer on a flip chart at the front of the room. If you simply ask a question and want people to volunteer answers in front of the group you need to wait for the answers. Most people won’t answer straight away. They need time to think. Expect this. Wait in a relaxed but expectant stance. Look softly at different people in your audience. Normally someone will speak. Wait at least 10 seconds. Yes, this will feel like an eternity to you. Repeat the question and ask them to talk to their neighbor about it. Give the answer yourself and move on smoothly with your presentation. After the presentation, ask for some feedback from individual audience members why the question didn’t work. You’ll learn valuable lessons for next time. Incorporate the answers you get into the flow of your presentation. If you don’t do anything with the answers, people will fail to see the point and will stop contributing. A great tool here is a flip chart. Writing up the answers on the flip chart demonstrates that you value the answers you’re getting. If the answers are coming very fast you may need to have an assistant to help you write them up. Write them up as closely as you can to the way the person said it. If you need to paraphrase check with the person that it accurately reflects what they said. Do not gush over one particular answer – others will feel slighted in comparison. Do not call on individuals to answer – they will feel put on the spot. Note that if you humiliate one person it has a ripple effect. Others will feel for them and will want to avoid the same fate. These 10 steps will help you avoid being left hanging – but they’re not a guarantee – asking questions is an art that requires practice and feedback. What other tips do you have for asking questions that engage your audience? 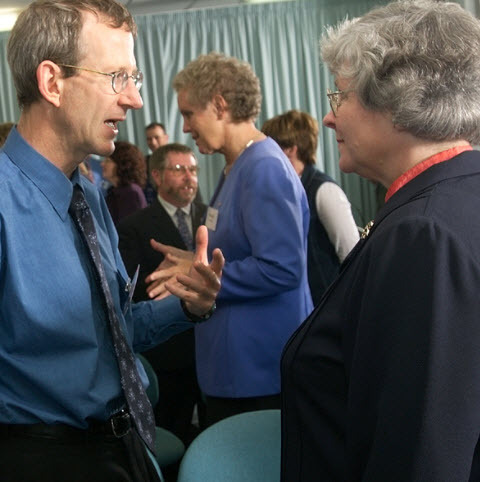 Here’s an old teacher’s trick for a shy audience: start with an action. Instead of asking the audience “Show of hands — how many of you…” — do the opposite. Ask everyone to raise their hands. This gets everyone “active” right away. Love this – so smart! Great post, Olivia. These strategies are highly useful and they absolutely work! Great suggestions, Olivia. Thanks for the insight. Everything you say about getting people to answer questions is right on. And what you say applies equally well to getting people to ask questions. I like to ask my audience questions. (I hope that I follow your guidelines when I do, although I need to work on framing my questions so they’re immediately and easily understood.) And then I follow up — if appropriate — with, “And what questions do you have?” If I ask, “Do you have any questions?” they just sit there. (It’s a yes/no question, which doesn’t encourage engagement.) But by asking what questions they have, I let them know I presume they have some. It doesn’t work all the time, but it usually gets people started. Great ideas, Olivia. Though you implied it, I think it’s worth making obvious that the very best questions are those to which there are many right answers, or even better, no wrong answers. O Que Pode E também O Que Não Pode. Atividade física e refeição. Treino: Bella muda a rotina de exercícios a cada 3 semanas. é de suma importância, pois além de internalizar os hábitos de alimentação saudável, transmitem conhecimento aos seus familiares. de aulas online que dá a flexibilidade necessária para quem tem filhos pequenos. a postura do resto corpo, e abaixá-las lentamente até voltar à posição inicial. te encher com os nutrientes importantíssimos que eles carregam. Isso faz com que a sua absorção seja menos difícil pelo espécime, sentindo os primeiros resultados logo nos primeiros dias. Lave as folhas com couve e depois bata todos os ingredientes no liquidificador e beba em seguida. Ovos trazem repleção e são um excelente alimento. de exercício, formar mais massa muscular, sem se cansar tanto. quem deseja perder peso, pois estimulam a saciedade e bom funcionamento do intestino. você dormir sem passar fome e perdendo halter gradualmente. um combo de nutrientes muito benéficos para funcionamento do organismo bem como colaboram até mesmo com procedimento da perda de peso. no seiva no prazo de duas horas após uma refeição. hábitos alimentares, os resultados lentos e ansiedade.